Chris Myers, who was swimming with his son, suffered severe lacerations to his legs and ankles in a suspected shark attack at Ballston Beach in Truro, Mass. A man who was attacked by a suspected shark while body surfing with his son near Cape Cod is expected to live, officials say. 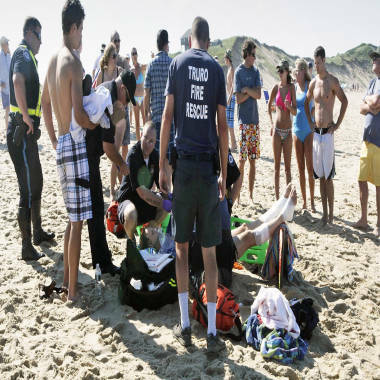 The attack happened around 3:30 p.m. Monday when Chris Myers was body surfing and swimming with his teenage son off the coast of Ballston Beach, part of the Cape Cod National Seashore in Truro, Mass. Witnesses on the beach say they saw a dorsal fin emerge from the water. Moments later, Myers was bleeding profusely from his feet and ankles. “It was, like, two people and this large dark blue-black thing came up and kind of torqued around and you saw this big dorsal fin and it, like, went back down,” another witness, Walter Palmer, told WHDH. Myers is treated after a suspected shark attack Monday at Ballston Beach in Truro, Mass., on Cape Cod. Gregory Skomal, a shark biologist with the state's Department of Fish and Game, later told a press conference that "the weight of evidence points to a white shark." Witnesses say that beachgoers -- including a doctor and a nurse -- jumped into action immediately after the attack. Emergency responders quickly arrived at the scene, bandaged Myers' legs and carried him off the beach on a stretcher. Myers is being treated at Massachusetts General Hospital in Boston, where he will undergo surgery. Ballston Beach was open Tuesday, but officials posted signs around the beach warning beachgoers of the recent shark sighting. There have been concerns about shark attacks all summer. Earlier this month a kayaker had a close call with the shark, WHDH reported, and since June there have been several shark sightings near seals.